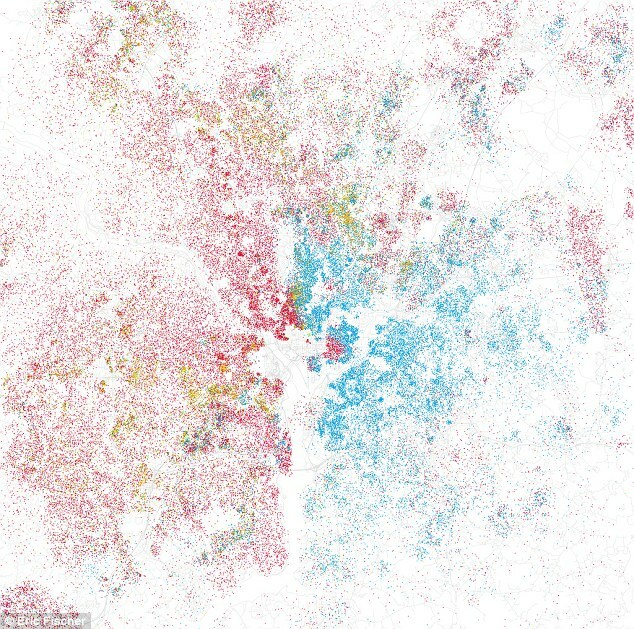 These are the maps that show the racial breakdown of America’s biggest cities. Using information from the latest U.S. census results, the maps show the extent to which America has blended together the races in the nation’s 40 largest cities. With one dot equalling 25 people, digital cartographer Eric Fischer then colour-coded them based on race, with whites represented by pink, blacks by blue, Hispanic by orange and Asians by green. The resulting maps may not represent what many might expect Barack Obama’s integrated rainbow nation to look like, as many cities have clear racial dividing lines. 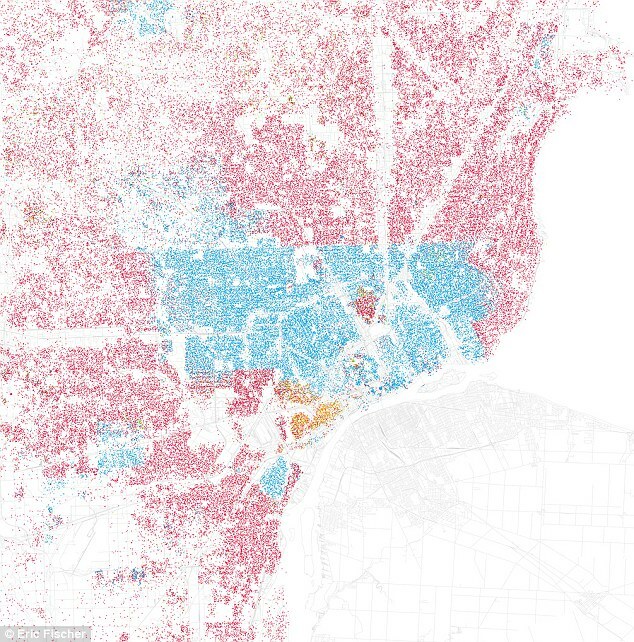 Detroit, for example, is infamous for its divide between black and white. But the map shows such a clear separation along the Eight Mile beltway that it is startling - almost bordering on segregation. The strict east-west divide in Washington DC is also well known - but chilling to see so starkly outlined on the map of the nation's capital. 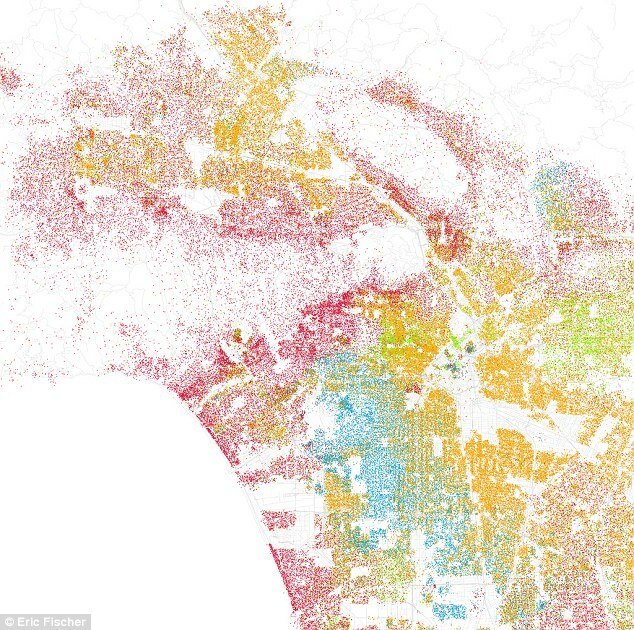 And in Los Angeles, the Latino population dominates the poorer areas of the city. But, reassuringly, the maps do show that not all American cities are so divided. In New York, the boundaries are so intensely coloured that they can hardly avoid being integrated. While the different racial groups still have their own areas, it is one of the most diverse of the major urban cities. 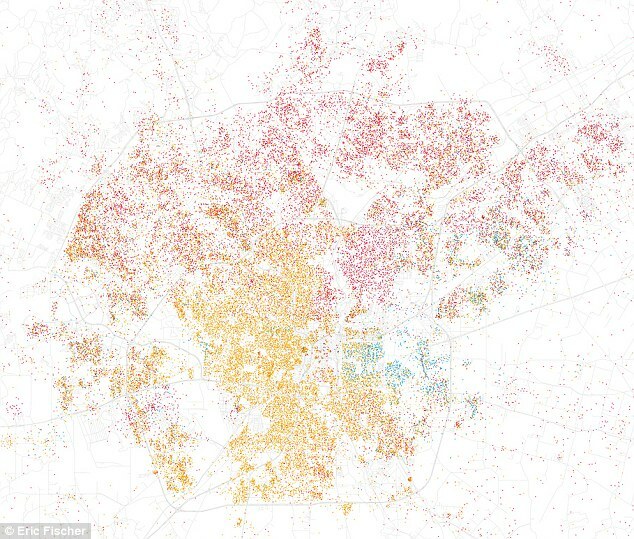 San Antonio in Texas paints a much better picture of integration, with whites and Hispanics blurring the boundaries and no real sign of a rich white enclave. Another Texan city, Houston, also shows a richer diversity of races spreading out from the centre and Las Vegas boasts a good mix. San Francisco also presents a better picture of racial integration together with a larger Asian contingent. The maps have quickly become a source of fascination for bloggers, even though the data used is a decade out of date. ‘I’d love to see the income data presented this way, too,’ said one. Good magazine's Andrew Price said: 'What do we, as a society, want to see in maps like this? I think it's safe to say that the clear separation of races in Detroit is a symptom (or cause) of serious social problems.